My name is Maripol. I was raised in France and I studied at École des Beaux-Arts in Nantes. I didn’t come to New York until I was 20 years old. After staying in New York for a little while I began working as a designer at Fiorucci. While I was at Fiorucci I worked my way up from a designer to art director. Back then I was frustrated that I couldn’t find any jewelry that suit my style, so I founded my own jewelry label and called it Maripolitan. At Maripolitan we made an assortment of rubber bracelets and crucifixes. 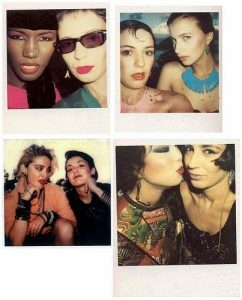 My jewelry became one of my most important contributions to the fashion community in the 80s, influencing pop-stars like Madonna and Blondie, as well as all of their fans. Aside from my work in the design industry, I am most often recognized for my polaroid photography, which I started a little over a year after I had gotten to New York. I had my camera on me at all times and I would photograph my friends and peers; the aspiring and established artists of the East Village. I have been lucky enough to exhibit my polaroids many museums and establishments such as MoMA P.S.1, Fondation Cartier, Brooklyn Museum, Portland Museum of Art and the Musée d’Art Moderne in Paris, Guggenheim Bilbao, Dundee Contemporary Arts museum in Scotland in 2015. Alongside photography, I found work as a film producer, helping out with the film “Downtown 81” that starred my friend Jean Michel Basquiat was directed by Glenn O’brien. After a while I decided to close down Maripolitan, but I continued art direction and styling for the likes of Cher, Elton John, and Marc by Marc Jacobs. In recent years I have been collaborating with several high fashion brands such as Dior and Valentino, shooting their clothes in my traditional polaroid format. In 2013 I directed the documentary “The Message” telling the story of my late friend and artist Keith Haring for his retrospective in Paris. Hanra, Hanna. “Maripol: ‘Did I discover Madonna? She discovered me! '” The Guardian. March 20, 2015. 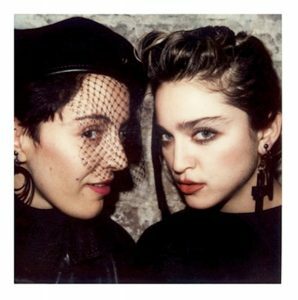 Accessed January 27, 2018. https://www.theguardian.com/fashion/2015/mar/20/maripol-madonna-photographer-stylist-polaroids-exhibition. Maripol. 1-17. 1980s. Classics, Maripol.com. In Maripol.com. Accessed January 28, 2018. http://www.maripol.com/collection/classic. Maripol. “Who I am.” Maripol. Accessed January 27, 2018. http://www.maripol.com/who-i-am.